Russell & Ashanta Jenkins Announce Release of "Isaiah an Unforgettable Gift" the 1st Book in the new Children's Series "Isaiah"
HARRISBURG, Penn., Feb. 11, 2019 /Christian Newswire/ -- A young jaguar trapped all alone in the wilderness is taken in by a family of lions they not only care for and protect him, but also introduce him to the bible. All this and more takes place in the new children's book "Isaiah an Unforgettable Gift." Parents looking for an uplifting Christian-based series of books for their children to read (or have read to them) have a good reason to be happy. Husband and wife Russell and Ashanta Jenkins recently celebrated the release of "Isaiah an Unforgettable Gift," book one of the "Isaiah" series. The whole series is based on real-life stories but told in an animated way using cute animals as the characters, like Isaiah who is a young jaguar. The authors do their best to entertain and engage their audience while teaching moral and life lessons, boosting confidence, and introducing children to Bible scripture in a way they are sure to enjoy. "Children need creative and innovative ways to be taught how to best handle certain situations, how to make the right choices, and live good lives," commented Ashanta Jenkins. "Our new book series is our way of trying to help in these areas while making the stories interesting and fun, so the children will want to continue reading them." 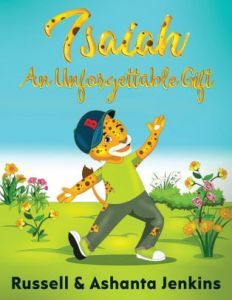 In "Isaiah an Unforgettable Gift," the young jaguar is trapped alone in the wilderness with no one to take care of him until he is saved and taken in by a family of lions who show him God's love. Soon after getting him home they realize Isaiah has behavioral problems. The understanding lions work hard to let him know that he belongs, that he is loved, and that he can always count on God to watch over him. The lions use the Bible to help Isaiah understand and overcome his problems in a positive way. This is likely to help any reader, who may have similar issues, realize they are not alone facing these challenges. Future books in the series will tackle issues such as honesty, not quite fitting in, ADHD, etc., all in a caring, and understanding Bible-based way. The second Isaiah book, "Isaiah Signs up for Soccer," is coming soon. Early feedback for "Isaiah an Unforgettable Gift" has been very enthusiastic. What an important book promoting God's love, inclusion of others, and family. It's good to see kingdom values and biblical scriptures included in a book for children that is relatable and entertaining, as well. Beyond that, 'Isaiah and Unforgettable Gift", has even gotten my grandchildren interested in the Bible and our Lord Jesus Christ, which is a huge service to us. Five-stars."